Now I know this one can only be found in Finnish. Stick with me, however, because it's one of the best non-fiction books I've read in a long while. Bill Bryson's Short History of Nearly Everything is one of my favorite books ever, both as an experience and through matter of principle. In some one thousand pages Bryson managed to describe the world with faithful accuracy and astounding insight. It was one of those books that marked an end of an era for me. It was the first book that described the world through rational, loving eyes and in a way that felt just right for me. God knows that worldviews vary from person to person, but I really understood that book. 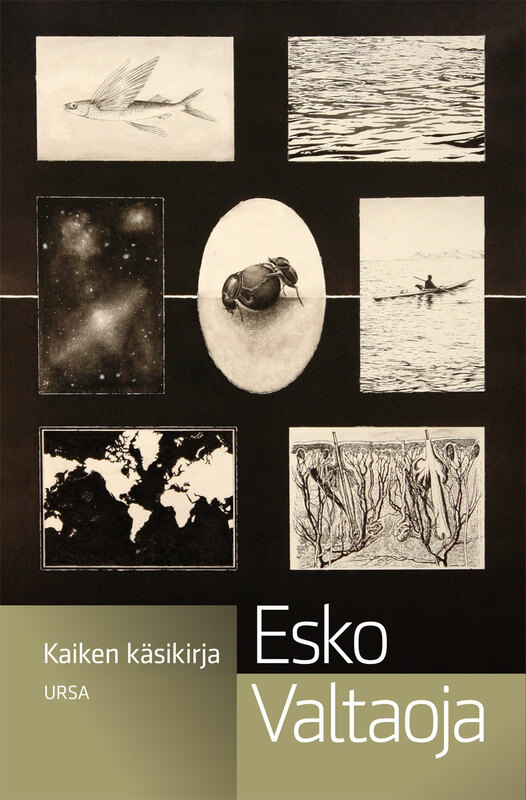 "Kaiken käsikirja", or the Handbook to Everything as I would loosely translate it, is not unlike Bryson's masterpiece, both in subject matter and ideology. It is a tale of how the universe came to exist and how we as humans have learned to see, hear and experience it. Valtaoja, who is a professor of astronomy, is a brilliant scientist as well as someone who can explain to you, in a few sentences, why the search for the Higgs boson is as important as anything in this world. Even though it deals with some fairly hefty matter, "Kaiken käsikirja" could be read by everyone from your grandmother to your florist. Where Bryson's look on the world concentrated on anecdotes and natural history, Valtaoja's approach focuses more on philosophy, religion and astronomy. In a matter of ten chapters, it manages to span the thirteen something billion years of this universes existence, the growth of civilization and the rise of both religion and science. Unlike the Short History, it does all is in under three hundred pages. Mr. Valtaoja is a man of few words, but those words seem to have weight that not many possess. I was especially moved by chapters on religion and philosophy. Without disclosing my own stance on the matter, the chapter on the evolution of religions is very likely the best case for agnosticism that I have ever read. Brilliant, beautiful work that hopefully anyone can appreciate. The argumentation is flawless, but even more importantly, the message is one of rational action and sane morale. With his beard, Valtaoja might seem like a preacher, but his doctrine is a combination of the scientific method and a healthy dose of humility. It is the modesty of it all that would probably catch foreign readers off guard. This book is not a grandiose statement like Richard Dawkins' the God Delusion, or a light-hearted (and supremely hilarious) Bill Bryson novel. Valtaoja plays coy and often underplays the seriousness of his opinions. He seems trustworthy, honest and the type of person you might meet in a local pub and he has a wonderful way of discussing the facts that makes them almost irrefutable. In high school, I used to tell my friends that if they ever picked up a non-fiction book, they should read the Short History of Nearly Everything. After reading Valtaoja's latest, I might change that suggestion: read "Kaiken käsikirja", it will change your life.